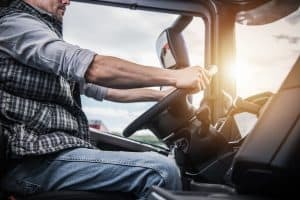 Truck Drivers are Dying in Record Numbers on the Job in North Dakota | Larson Law Firm P.C. An article in Business Insider reports that truck drivers have one of the country’s most hazardous jobs. Nationally, truck drivers account for about 2.4% of traffic fatalities each year, but in North Dakota, the truck driver accident fatality rate is 8.8%, which is the highest in the country. This high rate of trucker fatalities can be attributed in large part to North Dakota’s oil boom, but it’s also the state with the worst record for overall workplace fatalities, with most of those deaths being “transportation incidents,” according to the National Highway Transportation Safety Administration (NHTSA). Truck drivers interviewed for the article commented on the icy conditions and blowing snow they encountered driving through the state, the propensity for big trucks to end up sliding off the road into ditches, and an issue that is a challenge for large commercial trucks everywhere: the long stopping distance, on an icy road or at night, with the possibility of a deer or moose crossing. Braking to avoid an obstacle in a large truck usually spells disaster. Truck driving remains among the nation’s deadliest jobs, as the on-the-job death of truck drivers hit a record in 2017. Eighty truck drivers lost their lives on the job in 2017, which is 6.6% more than the 786 reported in the previous year, and 25% higher than in 2011. Trucking as a profession had 26.8 death per 10,000 workers, compared with 3.5 deaths per 10,000 for all other professions. Illegal drug use: The National Transportation Institute reports that about one in seven applicants for trucking jobs cannot pass a drug test. Driving behavior: Factors such as distracted driving, aggressive driving, speeding, and not wearing a seat belt are significant contributors to causing trucking accidents. Truck driving over long distances is boring, lonely work. If drivers are under pressure to meet unrealistic deadlines, it can provoke them into driving more aggressively than is safe for them and the other drivers with whom they share the roadways. Many motor carriers are adding advanced driver-assistance technology such as lane departure warning, adaptive cruise control, and automatic emergency braking when they order new trucks, but there are thousands of older trucks on the road which rely solely on the driver’s discretion and skills. If the drivers’ judgment is impaired, it puts them, and other drivers, at risk. 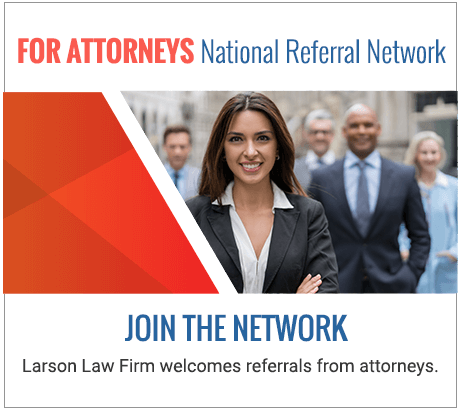 The trusted lawyers of Larson Law Firm P.C. have experience helping clients throughout North Dakota who have been injured in a truck accident. If you need legal assistance with a trucking accident injury, we are here to protect your right to recover compensation. You may schedule a free initial consultation by filling out our contact form or calling us toll free at 701-484-HURT. From our offices in Minot and Bismarck, we provide honest representation for clients throughout the state.